Whole cardamom - 2 Nos. Care should be taken not to burn cardamom while roasting. If you are not confident enough, use cardamom powder after grinding the rosematta rice. 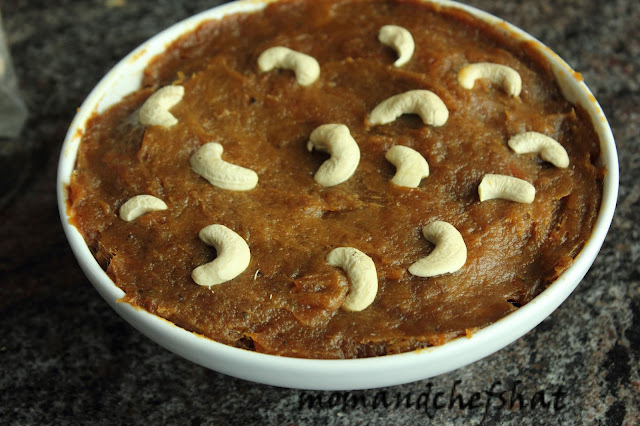 Ghee and cashewnuts are optional. Most people prefer ari unda without these two ingredients. 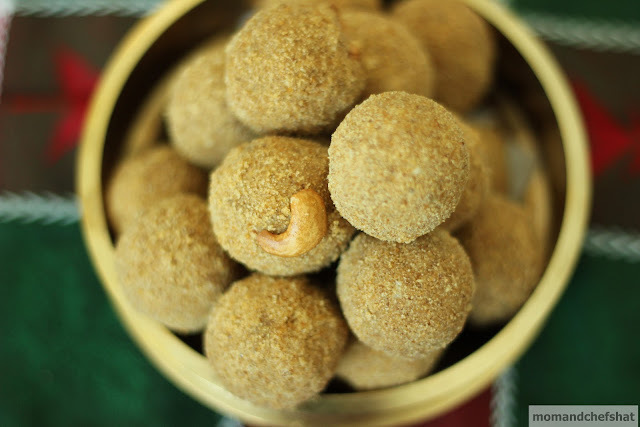 Color of Ari unda depends entirely on rice and jaggery you are using. Dry roast rosematta rice. Roast till rice starts to splutter (At this stage, rice starts to give a crackling sound). Now add whole cardamom and continue roasting. Switch off the stove. Let it cool for sometime. Now grind this in a blender to make a powder of it. Set this aside. Grind jaggery to make a fine powder. Add the grated coconut to this and give a final grind. Now add ghee and roasted cashewnuts if you are using it. 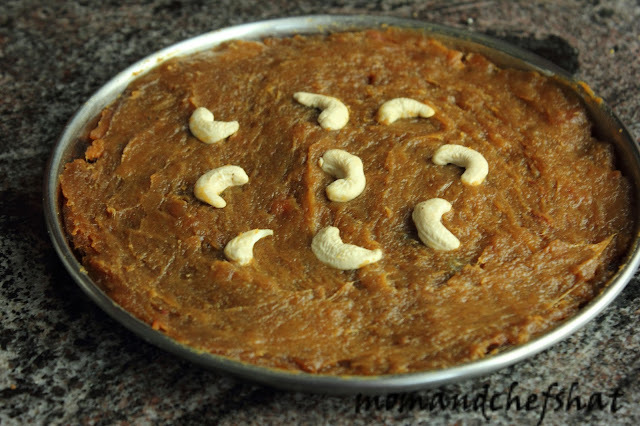 Now combine the ground rosematta powder, which is set aside with ground jaggery-grated coconut mixture, ghee and roasted cashewnuts. Mix this thoroughly and form balls with your hands. Pick muthira for any dirt and stones. Dry roast the horsegram. Pressure cook horsegram up to 6 whistles along with water. Release the pressure and open the cooker. 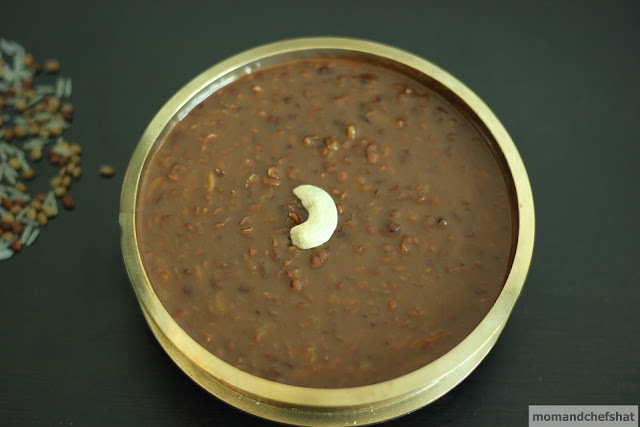 Add cooked basmati rice to the pressure cooked horsegram and cook till it gives 2 whistles. 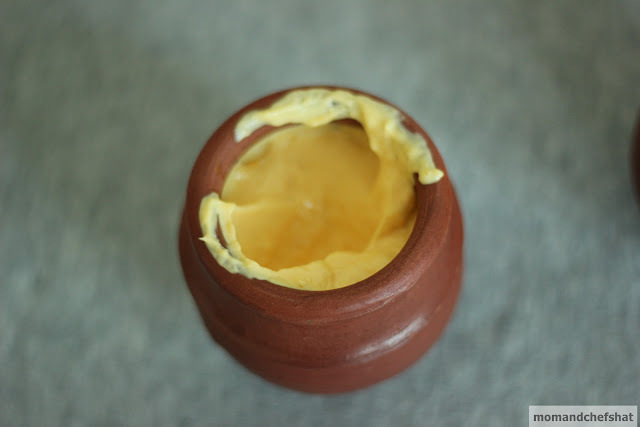 Prepare jaggery syrup by heating jaggery along with some water. Sarkkara paniyakkuka. Pass this through a strainer to remove any dirt. Now to the jaggery syrup, add the cooked horsegram basmati rice mixture and ghee. Saute them well till the water starts to leave (varattuka). Add thin coconut milk. Allow it to boil. When it starts to thicken, add thick coconut milk and switch off the stove (don't boil this). Now add cardamom powder and ginger powder. Stir well. One of the easiest granny cakes ever. It's such a pleasure to make one, when you are not in a mood to switch on the oven. Here is the recipe for a make ahead dessert cake. Line the sides of 9 x 3 springform pan. Lay half of the crackers on the bottom of the pan. Make puree of strawberries in a blender. Using a hand blender, whisk double cream and sugar to soft peaks. Keep 2/3 of the cream aside. Fold the strawberry puree into the remaining 1/3 whipped cream. Put 1 cup of plain whipped cream into a freezer bag or any resealable bag, snip off one corner of the bag. Pipe the cream over the wafers, along the sides of the pan to create a 1-inch dam. Pour the strawberry whipped cream into the centre of the pan and spread the edges to the dam. 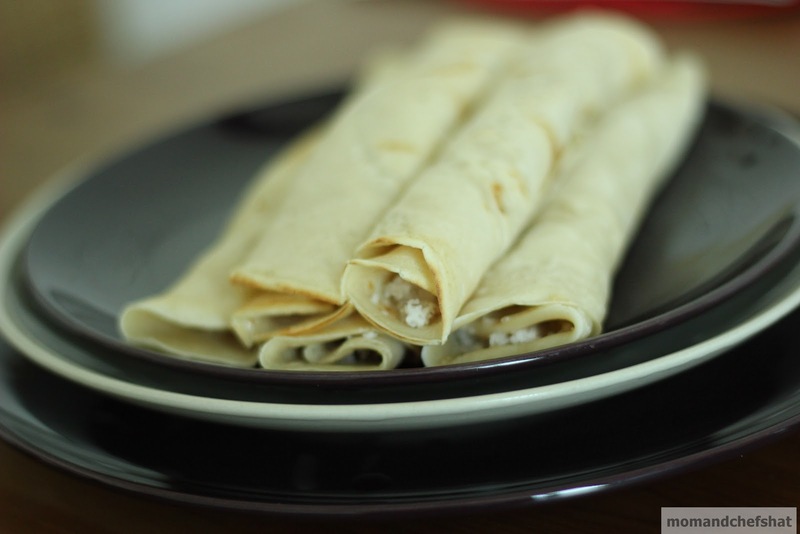 Arrange the remaining crackers over the cream, then top it with the remaining cream, spread to the edges and smoothen it. Decorate with tutti fruti. Chill this overnight or at least 8 hours. To serve, remove the sides of the springform pan and liner. Cut it into desired shapes and serve. 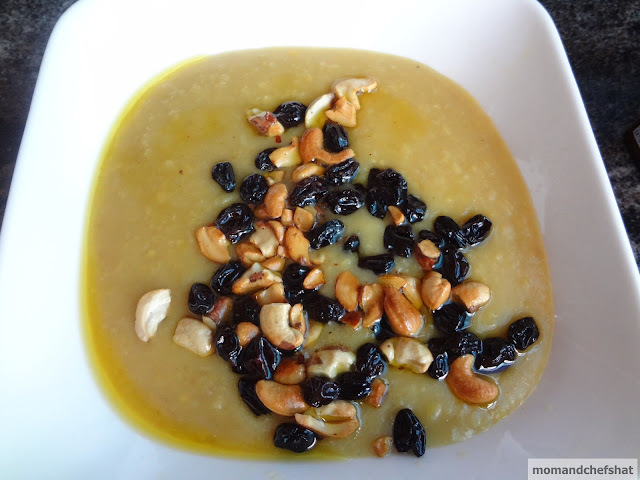 This is my MILs recipe. On her visit here, she gave us one box of chakka varatti. I am busy finishing it as my MIL is in the process of sending the next box. Optional: For flavoring you can use, either ginger powder or cardamom powder if you like. 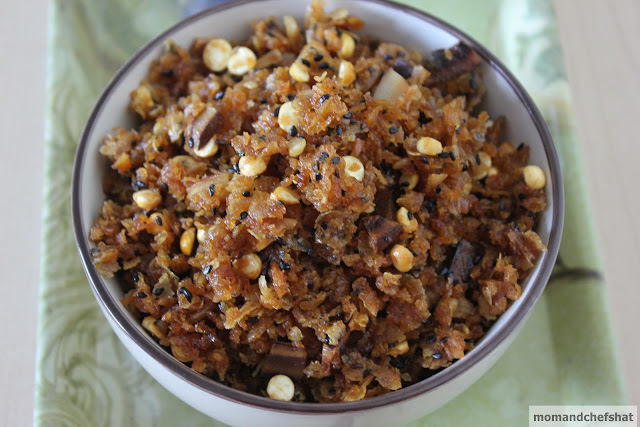 First, prepare sarkara pani (jaggery syrup) by boiling some water along with jaggery. When it is of somewhat thick consistency, switch off the stove. Pass through a sieve to remove any dirt. Keep this aside. Pressure cook jackfruit till it gives 3-4 whistles. Now run the cooked jackfruit pieces through blender. 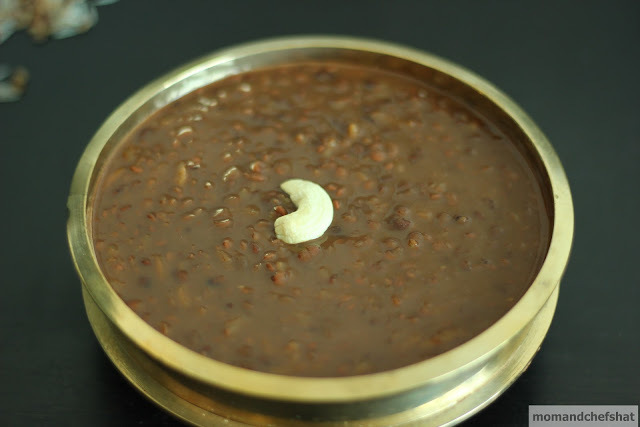 Now if you have uruli at home, use it by all means for cooking Chakka Varatti. if you are like me, start with a nonstick kadai. 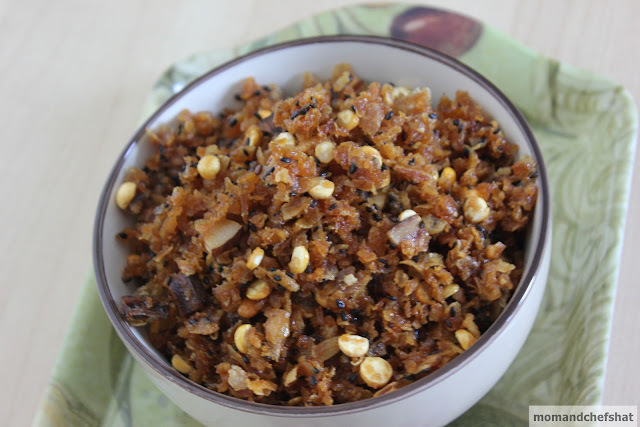 Mix blended jackfruit along with jaggery syrup in a kadai. Switch on the stove and start stirring. When it starts to thicken slightly, pour ghee little by little. When it reaches a consistency like the one shown in the first picture, switch off the stove. Lightly grease a plate/bowl with ghee and you can spread this. When cool, pack this well and refrigerate. It keeps well for a year and an absolute time saver. 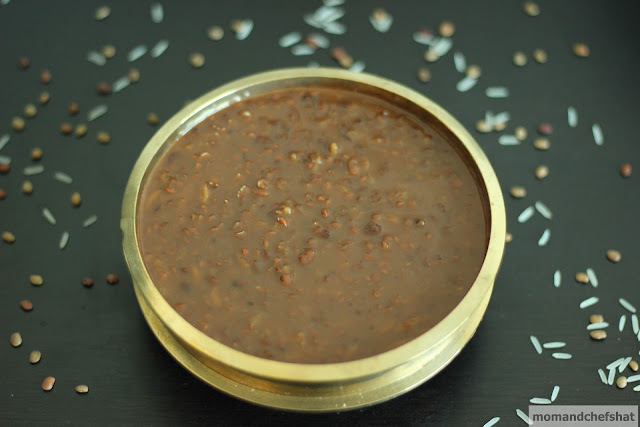 Chakka varatti works best as a filler for making Ila Ada, kozhukatta, or a small spoonful to your mouth from time to time. Call it a demon or devil, my house is under commotion when this is made. With everybody moving in and out of the kitchen, mornings are never the same. My baby wakes me up early, and I can see her standing up a stepper reaching for these chunkies in the fridge. Every time I make this, I promise myself not to make this again, but I end up doing it for friends. So for all my friends known and yet to be known, and to all who have asked for the recipe. Here is the recipe for my commotion chocolates. You can use any type of chocolate for this - bitter or semisweet. For somewhat good looking as well as creamy chocolates, go for cooking chocolates with 75% range. Nuts can be anything, but make sure the total quantity is not less than the total amount of all the nuts mentioned. Arrowroot biscuits can be a perfect replacement for digestive biscuits, if that is the taste you are used to. 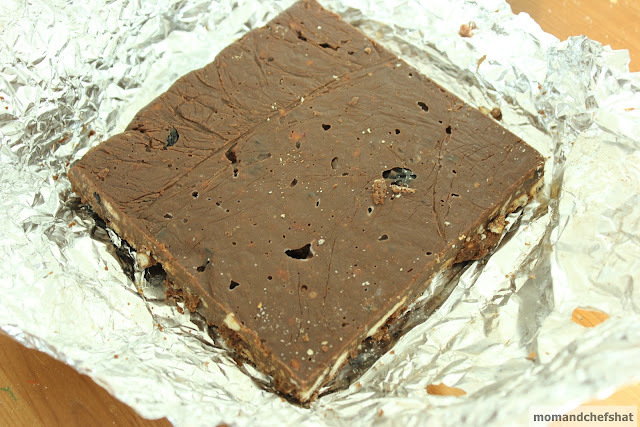 You can yield a much bigger slab of chocolate than shown in the picture with the ingredients mentioned. Line a cake tin with clear film. Melt the chocolate and butter in a large heatproof bowl over a pan of simmering water. Stir until well mixed. Add the broken biscuits, raisins, dates, and hazenuts or almonds. Mix well until all the ingredients are coated in the rich chocolate sauce. 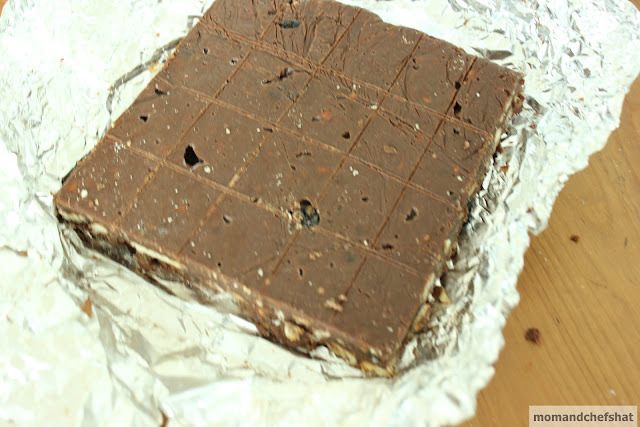 Tip the mixture into the prepared tin, make sure it is pressed well into the corners. Leave the top craggy. Cool, then chill until set. 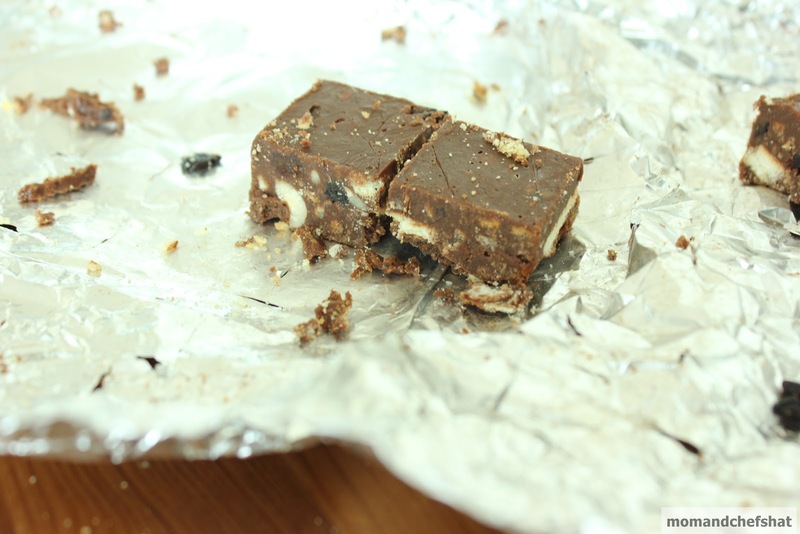 Lift the cake out of the tin using the clear film and then peel off the film. 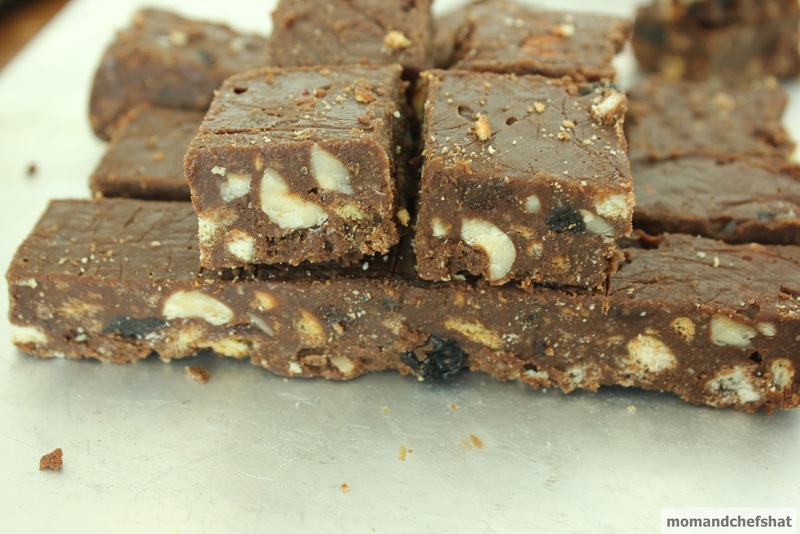 Cut into bars and serve at once. I suppose if Kerala Porottas go on a strike, men may go teary-eyed and start one of a kind revolution called Porotta Revolution. How hard if these men ask their wives to cook one at home? Until the advent of OTG, Kerala kitchens were mostly Maida-less. It is not that we had any strong aversion for white flour, but pretty much lifestyle was simple and choices were few. My home was no different. Talk to my Dad about Porotta and he can start a revolution, all for a good cause - health. For me, over the years eating something with maida has become a guilty pleasure. Can't say our home was cent percent flourless as we consumed far more wheat than any Keralite would do, which could easily throw us Mallus to shame, for we were supposed to be the primary consumers of rice. Of course rice flour was always there. Kerala household is not a typical one without rice and coconuts. It is rare to see a Malayalee who does not own a coconut tree in his/her lifetime. Proud owners of coconut trees and even more disappearing paddy fields, Huh! These were the occasional pancakes I have grown older with. Mummy neither explained why it made an occasional entry nor I ever asked. Now I know she was keeping family's health in forefront. Whenever it is made, I used to indulge in it like a luxury. The great Vasco who touched Kochi has left many Portugal ways and I believe this is one among them. For the same can be seen in Goa also, only with a difference of palm jaggery being used. If ever Great Porotta Depression strikes, I'm sure this pancake is gonna see glorious days as it is easy on stomach. 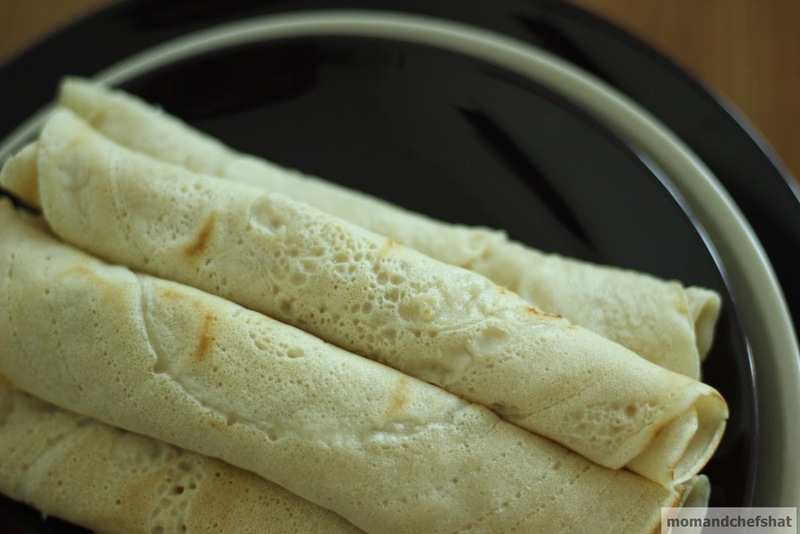 Prepare the filling by mixing grated coconut, sugar, and cardamom powder. Keep aside. Mix egg, all purpose flour and water to make batter. 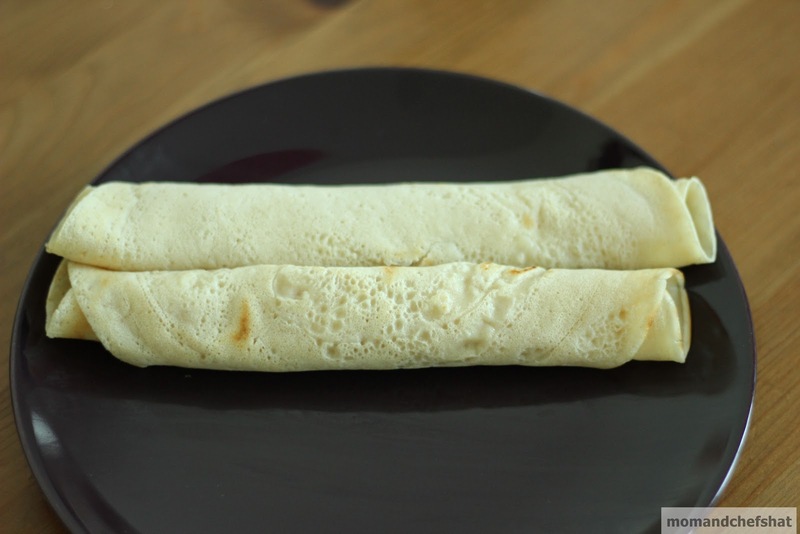 Pour the batter on to a tawa to make a crepe. Once it is done, remove from the pan. Place the filling in the middle of the crepe, fold, roll and pop into your mouth. Yum. 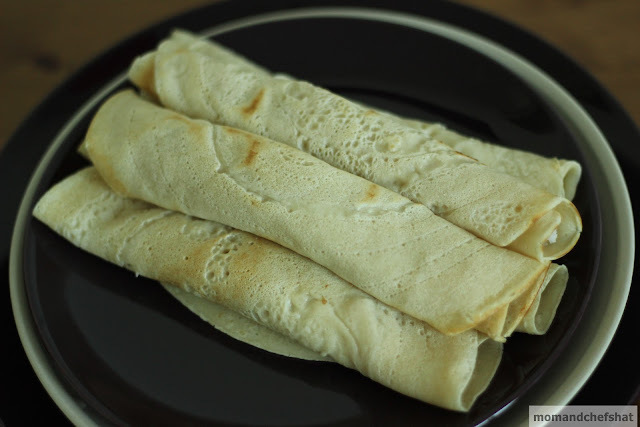 Proceed to make all the crepes in succession. Serve warm or else it may go soggy. Do all parents act deaf and dumb or is it a stigma attached to parenthood. We say white lies despite the fact that we don’t want our family to grow up on lies. Lately, we are doing all this and more and if you are on the same boat like us …… then …… Welcome to the lively yet disheartening world of parenthood. You are here to stay sometime floating in the magical world of parenthood, before you know that your children took away the bandwagon from you …..So what …. you have the perks glued to it ……. you grow along with them for sure. It is a 24 x 7 job you are never tired of, yet you are lost. So what with the dumbo, duffer, and liar in us? Read on. What I fear happened? No more concerns. Abbey now falls proudly into the category of icecream girls. A while ago, I wrote about her love for Kanji. Around the same time, she was taking baby steps towards icecreams. Let me correct you, now she is into full fledged licking and enjoying her World Class Choco flavour. Can’t blame her for every street is dotted with at least one BRs, if not 2. Our friends forewarned us about the Uncle around the corner in whites who took away their children’s appetite for homemade food. It is hard to avoid him at least with our eyes even when vehicles are moving at a lightening speed for you know red and white is a highly addictive combination. The uncle is none other than our own Uncle KFC. Now my Abbey is a little different, BR with blue and pink shops is what she embraces. In a flash, if she could see BRs, she shouts "Mamma ice-cheam." It all started earlier on. When Abbey asks for ice cream, I used to entice her with Amul Shrikhand kept in the freezer which hubby relishes with some bread, and now strictly the territory is leased by Abbey. I was very happy and comfortable on that white lie. I used to think how could she possibly say yes to the taste of shrikhand when her BR chocolate flavor is widely different. I was happy thinking I learned the tricks of the trade - mommyhood, when my baby corrected me by pointing the BR shops afar. I guess she gave me a hint - I know what I am doing, still I am eating the good old stuff that you are used to. 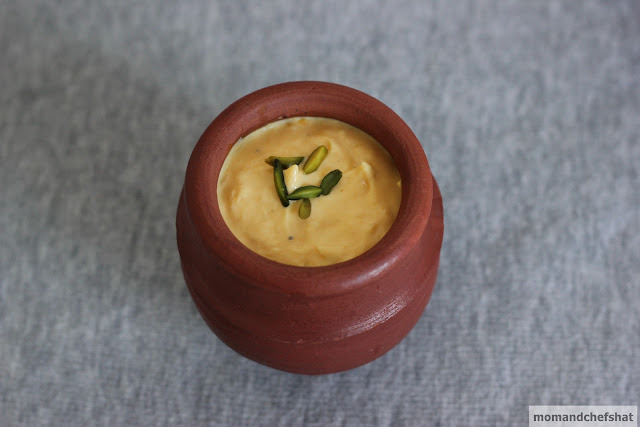 So now superscript being laid, I decided why not some homemade Shrikhand …… and oh lately I am mostly thinking about HOMEMADE ……. I guess HOMEMADE is synonymous to motherhood for I know I am completely hooked to this world. Wishing you all a late Happy Mother’s Day. 1 kg of yogurt yields about 2 cups of hung curd. 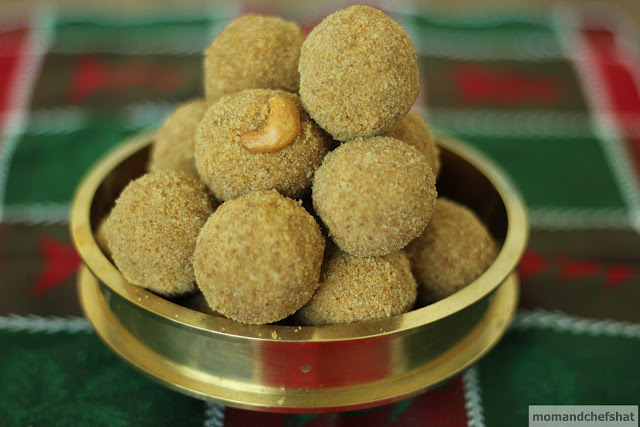 Add cardamom powder little by little, for you only know your child's tolerance levels to it. 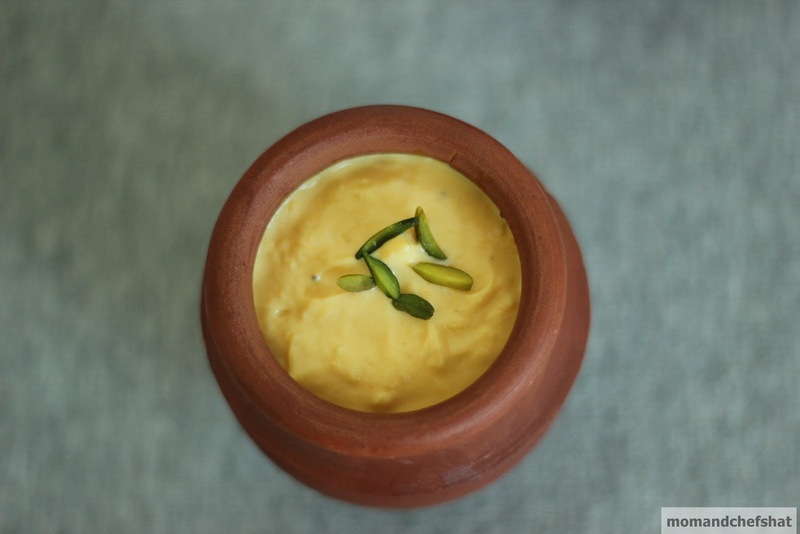 You can even use 2 cups of Greek yogurt to quicken the process of making Shrikhand. In a cheesecloth, hang the yogurt overnight to remove the whey. Now you get hung curd. 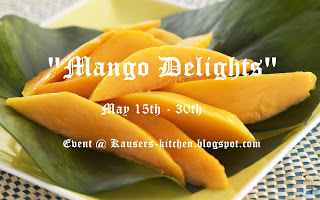 Blend the mangoes without water to get a thick puree. Crush the cardamom pods. 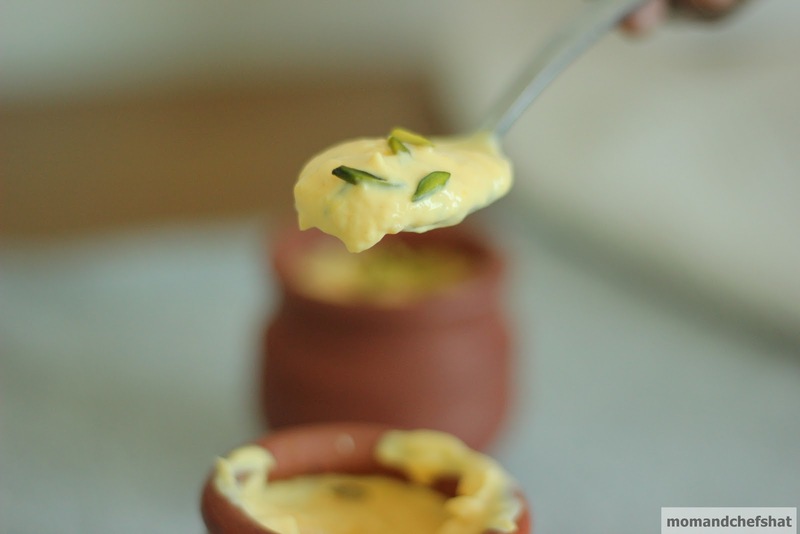 Mix thoroughly hung curd, mango puree, cardamom powder, and sugar as desired. Serve chilled. 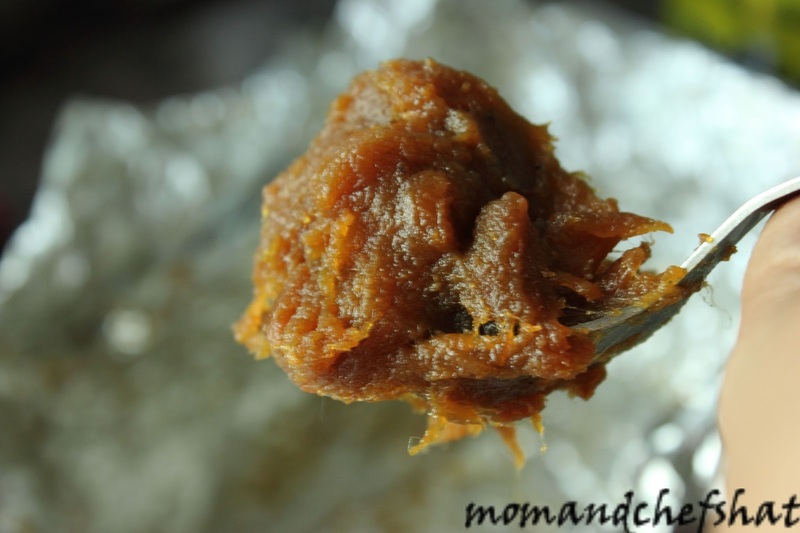 Melt the jaggery in water and strain. There should be 6 cups of this thin syrup. In a hot kadai, add some ghee and fry black sesame seeds. Fry the roasted chana/pottukadala in 3 tsp of ghee without losing color. Fry the coconut pieces also in ghee. Place uruli or kadai on fire. Pour the thin syrup into it and boil. 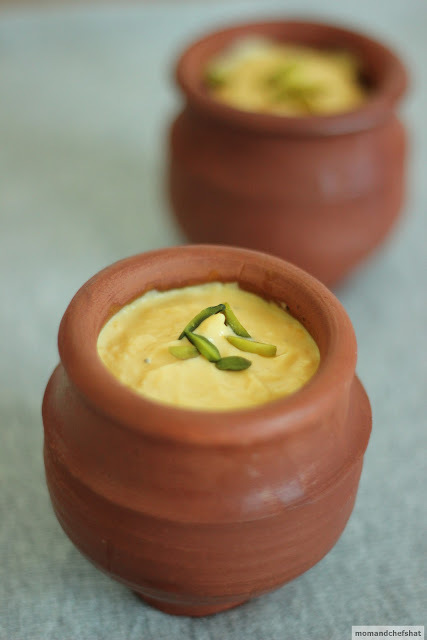 When it bubbles, toss in the grated coconut, lower the flame and stir continuously till all the water is absorbed. Removed coconut mixture from fire before it becomes sticky. 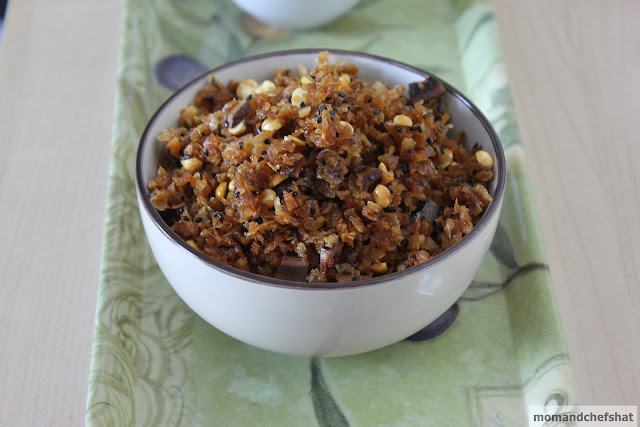 When it becomes slightly cool, toss the aval into the coconut mixture and stir well till it is thoroughly mixed. Then add the fried black sesame seeds, chana dal and the coconut pieces. Add 1/4 cup of ghee and the cardamom powder. Mix thoroughly and allow it to cool. When it is absolutely cold, store it in a big, dry vessel. Keep it for a day before using. Sprinkle cardamom powder now to retain the flavor. 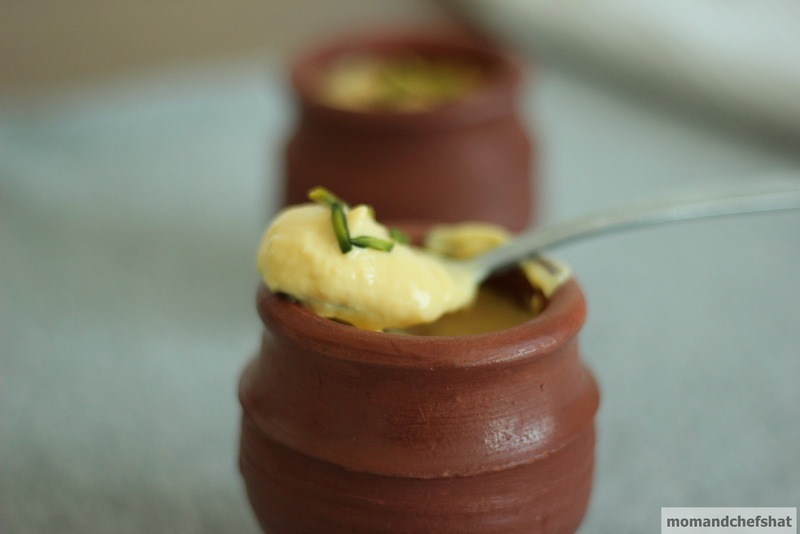 Firstly, dry roast moong dal. Secondly, cook moong dal. Melt jaggery with water to get jaggery syrup. Pass the syrup through a sieve. Add the cooked dal to the syrup and stir well for 5 minutes. Add ghee to this and stir for 2 more minutes. Add thin coconut milk and let it boil. Now add thick coconut milk and don’t boil it. Switch off the stove. 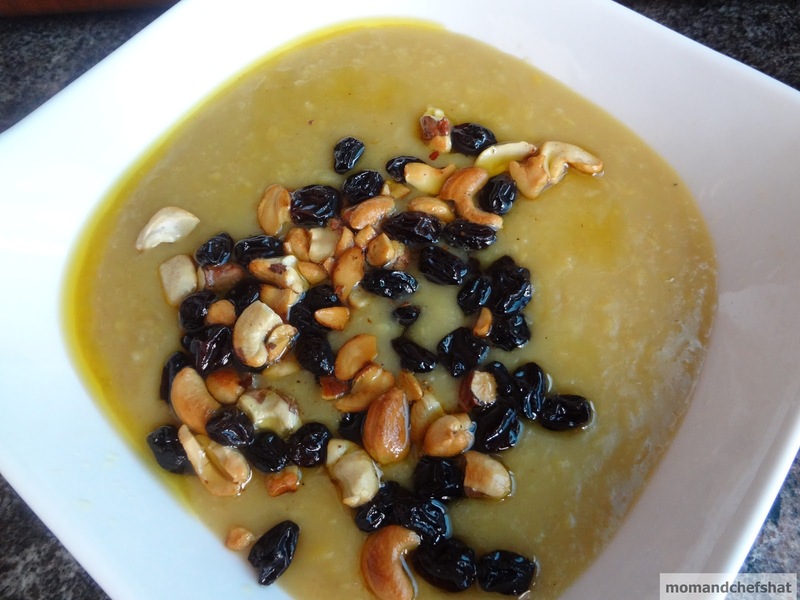 Fry cashewnuts and raisins in ghee and pour over payasam.